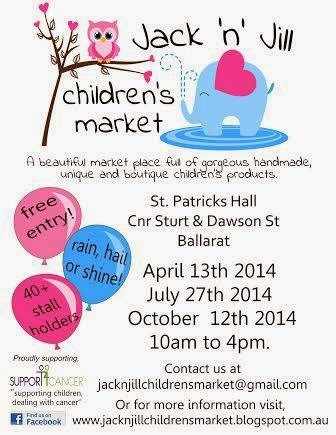 Jack 'n' Jill Children's Market: Only 2 weeks to go!! We are very excited here at market headquarters with only 2 weeks until our first market for 2014. We are full to the brim and not one spare spot is left. We look forward to showcasing over 40 stallholders and their goodies leading up to the market, so make sure you get your shopping list ready, it's going to be a fantastic! !